This traveling display tells the story of one Las Vegas casino’s special connection to the people of Hawai'i and the unique culture that evolved there through rare photographs, objects, and video. Developed by the Japanese Cultural Center of Hawai'i, the exhibition was sponsored by Hawai'i Air Cargo, Kyo-ya Hotels and Resorts, Nippon Golden Network, and Vacations Hawaii. The Los Angeles presentation is part of the Museum’s Salon Pop Programs. 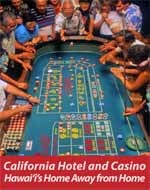 Join Dennis Ogawa and John Blink for an insightful discussion about California Hotel and Casino: Hawaii’s Home Away from Home, the book on which the display currently on view at the museum is based. Available for sale at the Museum Store and at janmstore.com. Co-presented with the Japanese Cultural Center of Hawai'i. Free admission for members of the Japanese Cultual Center of Hawai'i this weekend.